Once again, many thanks to OMY for inviting me to another movie preview. The first being Star Trek last month and yesterday’s Monsters vs Aliens. From DreamWorks Animation, Monsters vs Aliens is a 3D animated film about a young woman, Susan, who is hit by a meteorite on her wedding day. Having been exposed to the radiation of the meteorite, Susan grew rapidly in size into a giant and is captured by the military soon after. During her custody, she meet a group of monsters, each with their own distinct personality. When an Alien invasion threatens Earth, Susan and her new found friends are called to arms to save the world. It’s also refreshing to watch an animated movie not about taking animals which I felt was way overused for the past few years. Monsters vs Aliens trailer below. Movie will be release next Thursday 28th May. What, free movies? What is this OMY thing? It’s related to the Wanbao and Sinming? Do you have to do anything in return? OMY stands for “Online Media for Youth”. it’s a bilingual news and entertainment portal from SPH targeted at youths and youths at heart. all i have to do is to blog about the movie and donate 2 litres of my blood. lol. there’s no blood donation required, i was just joking. ^^; anyway blood donation is a good cause. (non related to the movie) was planing to really donate my blood but the blood drive got canceled due to the recent flu virus scare. donating 2litres is overkill. You can only donate 500ml in one go or else you’ll faint. But what if Gordonator watched and dislike the movie, would he stated any bad remark(s) in this blog??? Would u, Gordonator? haha good question. if i’m not interested in the movie, i will probably not go for preview screening. so what if i dislike the movie as u mentioned? i will give my honest opinion. i am grateful and honored to be invited but i won’t give positive reviews just because it’s free. that’s against the point of blogging whereby one should be free to express his thoughts. Ok for Bloggin the movie review, which gave good honest and personal review. Do u really mean the real physical blood donation? i didnt watch the movie in 3D. M vs A is one of my least favorite movies. I must be racist against monsters. I unno. Saw this movie a few weeks back, while no masterpiece, is definitely entertaining. btw guys, what alvin mentioned only applies to those living locally. I watched the trailer. It wasnt interesting at all. Unlike those old pixar movies like The Incredibles, Cars which are totally amzing and hooked me up. What is happening to animated movies these days? 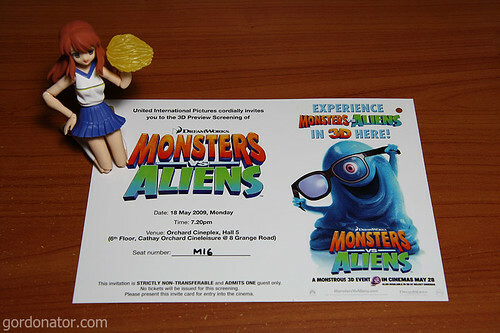 I liked Monsters VS Alien. Even went and saw it a second time. Didn’t get to watch it in 3D at either place thou. But that’s ok 3D don’t work for me anyway. the president was great for LOLs. the first contact scene was hilarious. Cool! You’re now a movie reviewer… I’m thinking watching x:men origins over monster vs. aliens..
and blob takes one car up and wanted to lob it off the bridge. yup my favourite scene. lol. I havent watched yet. Seat M16,..ummmh, numerated seats. I already watched all those movies…they were pretty good!!! judging from replies here, seems like the movie was shown earlier outside singapore. Ooh, really interested in joining OMY. Will definitely be willing to blog about movies. Kinda hard for me to ask, but how do I get involved in this? how is your chinese writing and reading?